Oaks of Avent Acres in Holly Springs North Carolina is a great neighborhood that's extremely affordable with a club-house and pool. 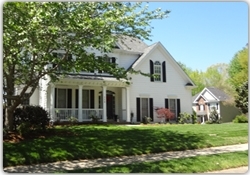 The neighborhood is made up of a lot of different home styles, including ranches and multi-story homes. The homes feature large mature treed lots as most of the homes was built between 1999-2005. One of the best features about Avent Acres is its great location. You can hop right on 55 with all the new shopping centers by the new 540. Or you can go on Ballentine that leads behind the cultural Center in center of downtown Holly Springs. The area can’t beat for accessibility or convenience. The Oaks of Avent Acres HOA organizes fun neighborhood activities and there are plenty of opportunities to meet and socialize with your great neighbors. The neighborhood is currently being managed by R.S. Fincher& Company make sure you check out there page to make sure this neighborhood works for you. Make sure you check out the Holly Springs Market Report to download this months report on the overall conditions of the housing market. Take the time and learn whats going on locally.